1- Set up everything so that you can go on to change the tire safely. Make sure to minimize danger of being hit by passing by traffic (wear a yellow safety vest, switch on emergency four blinker signal, position a warning triangle). Make sure the vehicle is parked on solid, level terrain. 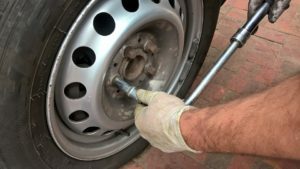 Lay out the jack, wrench and spare tire next to the wheel than needs to be replaced. 2- Place the jack in the spot designated for it just under the side of the vehicle where the flat tire is. If there is no mark specifying such a spot make sure to position the jack under a point strong enough to support the force soon to be exerted on it. 3- Do not begin lifting! First Undo the nuts a half a turn each by turning them anti-clockwise using the wrench. 4- Lift the car using the jack until the flat tire is at least four inches off the ground. Undo the nuts, remove the wheel and replace it with the spare. Redo the nuts tightening them securely (one after the other several times) but taking care not to rock the vehicle too aggressively. 5- Lower the vehicle and lock nuts into place, tightening one after the other several times, you may want to step on the wrench for that one final twitch. 6- Remove jack and return everything you used back to place.